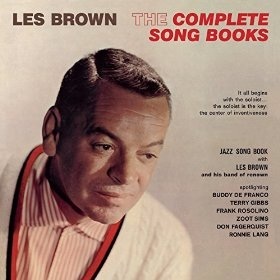 After leaving Duke University Les Brown moved to New York in 1937 where in wrote arrangements for a number of bands including Jimmy Dorsey and Isham Jones. He was invited to form a band foor the Hotel Edison and included in the deal was recording deal but in 1940 he formed a new band and secured a gig at the New York Arcadia Ballroom and also deputised for the Charlie Barnet band at the Lincoln Hotel.. He engaged a young singer for the band who was working with the Bob Crosby band called Doris Day who stayed with the band until she married for the first time but she was persuaded to return to the band in 1943 when they recorded “Sentimental Journey” which became a hit and boosted the bands reputation. Helped by Frank Comstock’s arrangements and hit with Skip Martin’s arrangement of “I’ve Got My Love To Keep Me Warm” the band went from strength to strength but with the downturn of the band business he again disbanded in 1946. He was forced to reform in March 1947 to fulfil a one off gig and from this he was offered the chance to be hired for the weekly Bob Hope radio show. These recordings are from a later period but much of the earlier band is still present and with a roster of fine arrangers such as Frank Comstock, Billy May, Bill Holman and Ben Homer this superior dance music with lots of jazz content. “The Jazz Song Book” has a number of guest soloists from the jazz scene including Buddy De Franco, Frank Rosolino and Zoot Sims who solo on various tracks. The opening track “King Phillip Stomp” is Buddy De Franco all the way backed by some scintillating brass and the whole piece swings along nicely. Trombonist Frank Rosolino gets his chance to shine on “Don’t Get Around Much Anymore” and his fluent style is a joy to listen to. The brass section fairly bristles behind Zoot Sims hard swinging tenor on “Let’s Get Away From It All” spurred along by the superb drumming of Jack Sperling. “The Swing Song Book” is just as good with numbers like “How High The Moon” and “Pick Yourself Up” with plenty of good section work and intriguing solos from members of the band. This is a well drilled band but loosee enough to create a genuine jazz feeling with solos to match. We have a tendency to forget how much jazz content existed in a number of the big bands and it is only now we are beginning to appreciate this.